The Library is by far the largest and grandest of the rooms in J. Pierpont Morgan’s Library. The walls, reaching to a height of thirty feet, are lined floor to ceiling with triple tiers of bookcases fashioned of bronze and inlaid Circassian walnut. Two staircases, concealed behind bookcases at the corners of the room, provide access to the balconies above. A pair of casement windows, incorporating fragments of stained glass, provides illumination from the north. 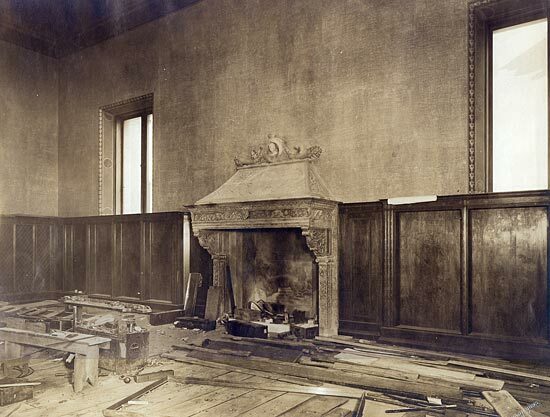 The mantelpiece on the east wall of the Library is carved of Istrian marble in the Renaissance style. Above is a tapestry, The Triumph of Avarice, with a moralizing Latin inscription that translates, "As Tantalus is ever thirsty in the midst of water, so is the miser always desirous of riches." The tapestry belongs to a series depicting the Seven Deadly Sins, designed by Pieter Coecke van Aelst (1502–50), the father-in-law of Pieter Bruegel the Elder. It was produced in Brussels in 1545 by the workshop of Willem de Pannemaker (active 1535–78). Four other tapestries from the series are in the Spanish royal collections, and a complete series of seven is in Vienna's Kunsthistorisches Museum.